Comprised of twenty episodes on a loop, Spheres 1-20 features a rotating fly-through of 3D-generated environments. These “Spheres” are rendered digitally, then projected onto colored paper in Ludy’s studio and recaptured with a digital camera. The resulting high/low-fi picture quality mediates between the virtual and the physical spaces in which the artist works. In Spheres 1-20, ambiguous forms float in polygonal landscapes created from snippets sourced from Ludy’s wanderings of the internet, personal photos, and samples of computer-aided-drafting motifs. 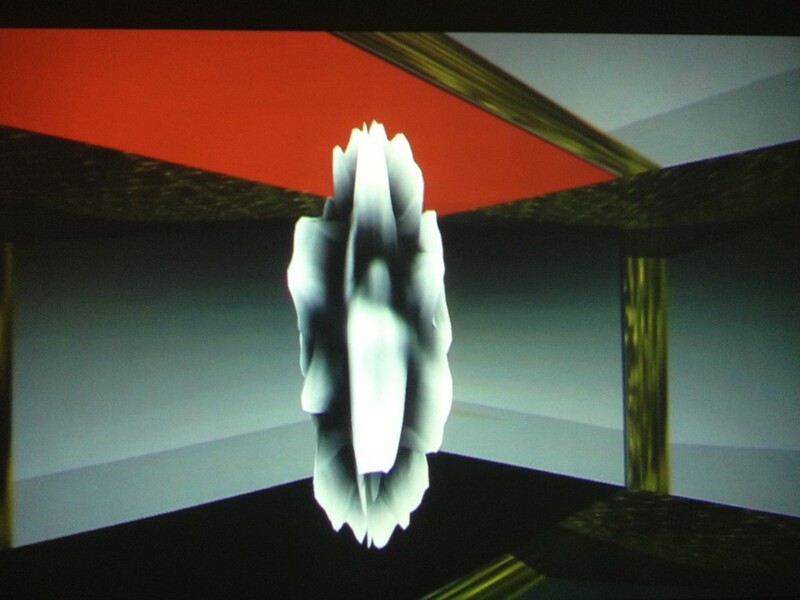 Taking two-dimensional screen captures and imagemapping them onto three-dimensional rotating forms, Ludy creates her Spheres as virtual architectures that refer to an amorphous and psychological space. Between each 1-minute episode of the video, abrupt cuts shift the focus to new structures while an audible synthesized drone changes pitch with each reveal, similar to the shift found between levels in video gameplay. Ludy’s interest in spatial compositions stems from her lifelong captivation with video games, her time spent haunting Second Life and Google Warehouse looking for imagery, and her professional experience creating immersive environments as a VJ for Los Angeles nightclubs. She pursues a sense of familiarity and the uncanny, pointing to the flexible spectrum of spaces designed for human habitation and the facsimiles of those spaces found online.